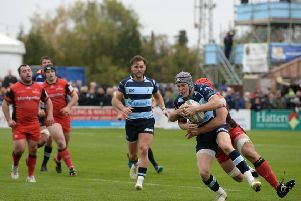 Bedford Blues head coach Mike Rayer was pleased with his players’ attitude on Saturday, despite seeing his side beaten 25-19 by Doncaster Knights at Castle Park. The defeat means the Blues slip below the Knights into 10th position in the league with just one match to play in the Greene King IPA Championship season. Two Dougie Flockhart penalties were the difference between the sides as Dean Adamson, Paul Tupai and Nick Fenton-Wells’ tries were cancelled out by scores from Latu Makaafi, Lewis Tyson and Matt Challinor for the hosts. Despite the defeat, Rayer said: “I was pleased with the attitude of the guys; I thought we showed great character, good intensity and we should have won. “Donny showed great ambition I felt and both sides tried to play a bit, just skill errors let everyone down. “We were lucky to be going in 10-7 down as we dodged a couple of bullets through some good desire in defence. The match lacked great intensity in the first half on a pitch that was sandy in places, and the slow tempo was partly down to two injuries to two Bedford forwards inside the opening four minutes. Justin Blanchet and James Currie were both treated on the field for a lengthy period of time on Saturday, but Rayer has confirmed neither injury was too serious. “Justin has damaged his ankle ligaments; it’s not too serious but he’ll be absent next week against Nottingham,” confirmed Rayer. Meanwhile, Bedford’s Canadian international full-back James Pritchard scored a try and kicked six conversions for the Barbarians all-star team in a 97-31 win over Heriot’s in an exhibition rugby game marking the 125th anniversary of both clubs. The Barbarians, an invitational side, ran in 15 tries to five for Heriot’s. “Well what an experience,” tweeted Pritchard, Canada’s all-time points leader.